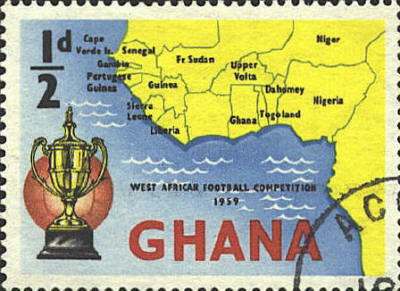 This stamp was issued to commemorate the West African Football Competition in 1959. The word "Portuguese" is misspelled in "Portugese Guinea." In some cases errors such as this are corrected and the stamps reissued. This error was not corrected. Also Ghana's neighbor, Ivory Coast, is not named.